At Capitol Steel, great pride is taken by a hardworking and tenacious group to add value to steel. It starts with thorough study and knowledge of the project specification augmented with a big picture review. We are proactive – anticipating challenges that will occur in the field and modelling and testing theories for the best solution. Before we start, we tailor our quality program and production plan to each job. 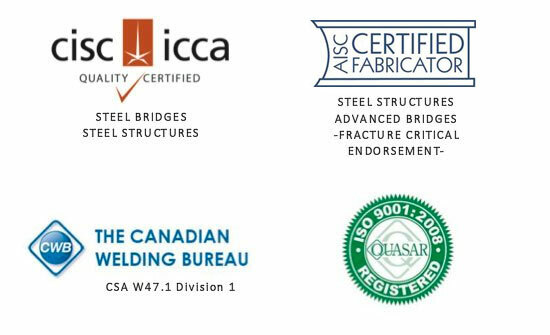 Capitol Steel is a W47.1 division 1 company certified to ISO 9001:2008 and CISC – Steel Structures with an established Quality Management System (QMS) and standard procedures for all key processes. Quality workmanship that is built to last includes safely completing the projects. Capitol Steel is committed to providing and promoting the highest possible level of health and safety and has developed a health and safety program that meets and in many cases exceeds all legislative requirements and the COR safety certification standard of excellence. COR Safety Certification ensures our employees, our customers and the general public are protected to the highest standards of safety planning. Capitol Steel maintains a Safety Management System designed to ensure our people follow safe practices and are able to identify and correct unsafe working conditions. Active participation and adherence to the Safety Management System is a condition of employment. Capitol Steel has developed and implemented a Quality Management System which begins with the pre- and post-award design consultation for the project and continues through engineering, detailing, production, transport logistics and deployment of the final product (installation and/or erection as required). Organization of our Quality Management documents, including their contents and arrangements, is based upon ISO 9001:2008 standards and the Canadian and American Institutes of Steel Construction (CISC & AISC). These international standards promote the adoption of a process approach when developing, implementing and improving the effectiveness of a Quality Management System to enhance customer satisfaction by meeting customer requirements. Demonstrating our ability to consistently provide effective consultation, products and services that meet customer needs and requirements. Enhanced customer satisfaction through the effective application and continual improvement of the quality management system. Ensured product conformity to the requirements of our customers by producing project specific documents. Our Quality Management System has created a culture of quality and continuous improvement through all levels of the Company. It is our belief that quality awareness is an essential part of the production process and integral to satisfying our customer’s changing needs. The quality of the work we produce is directly related to the reputation we hold in the industry and our future growth and success. The Quality Manual defines Capitol Steel’s approach and details how these processes interact. The Quality Manual also references our documented procedures against the requirements of ISO9001:2008, the requirements of the Canadian and American Institutes of Steel Construction (CISC & AISC). Standard Operating Procedures outline how we control our processes at our facilities and work sites. Prior to the start of fabrication, contract specifications are thoroughly reviewed. Capitol Steel creates and maintains project specific Inspection Report Forms, Inspection and Test Plans (ITP), and many other forms of documentation in a controlled manner to ensure our process are working to ensure a high level of product and service quality specific to each project’s unique requirements. Employees complete Job Specific Training (JST) packages, designed in compliance with the contract documents and related specifications. Internal and external audits are scheduled to ensure compliance with the QMS. QC turnover package is provided to owners. Capitol Steel continually reviews its quality performance and undertakes corrective and preventative actions to improve its current processes. Through inspections and other forms of product and process monitoring, Capitol Steel has processes in place to control non-conforming products to mitigate any deliveries of products that do not meet requirements (quality escapes). Fabrication is closely monitored and controlled by Capitol Steel inspectors, utilizing pre-planned Inspection Hold Points (IHP) to ensure critical items are inspected before proceeding. Extensive quality control takes place throughout the fabrication process guided by the Inspection and Test Plans and Quality Plan generated to ensure conformance to the project specifications and governing codes. Visual and dimensional inspection takes place by in house inspectors and are documented under the direction of Capitol’s Quality Manager. Non-destructive testing is performed as specified in the contract documents by local third party inspection agencies certified to W178.1 by the CWB. Quality control in the field is facilitated with the use of a Robotic Total Station which is used to survey various assemblies as they’re being erected to ensure proper alignment and fit up. As-built surveys are captured and analyzed with 3D modeling software; the data is compared to theoretical design to ensure proper fit up and alignment of new steel. Other uses of the Robotic Total Station include taking as-built surveys of embedded items and compare to erection drawings, further aiding in locating and positioning steel members during erection. For an accurate and detailed as-built of the entire structure, the structure can be surveyed using a Faro 3D laser tracker/scanner which provides a point cloud model.